In another win for Australian defence industry, Tasmanian company Penguin Composites has signed a contract with Thales Australia to build bonnets and various parts for the new Hawkei protected Army vehicles. The three-year contract, worth over $8 million, represents the company’s first major defence-related contract, and is expected to create around 15 jobs at its facility at Penguin in north-west Tasmania. Minister for Defence Industry, the Hon Christopher Pyne MP, has congratulated Penguin Composites and said the contract would provide a significant boost to Tasmania’s share of the nation’s defence investment. “This contract will not only create new jobs in Tasmania, it will also involve the up-skilling of existing personnel to help deliver this work,” Minister Pyne said. In October 2015 Thales Australia signed a $1.3 billion contract with Defence to supply 1100 Hawkei vehicles and more than 1000 trailers, and is now ramping up for low-rate production. Penguin was engaged after Thales identified a number of Australian suppliers who could provide these components. 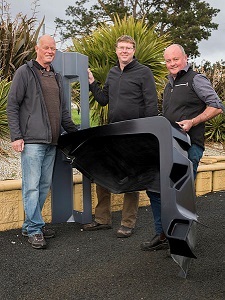 Founded in 1976, Penguin is a home-grown Tasmanian company specialising in the manufacture of composite products. The company’s capabilities include design and engineering of moulds and plugs, fibreglass and composite component manufacturing, in addition to specialist composite product manufacturing.